Beat Boy is packed with features that allow a guitarist or bassist to improve their abilities easily and reliably while having fun playing their instrument. 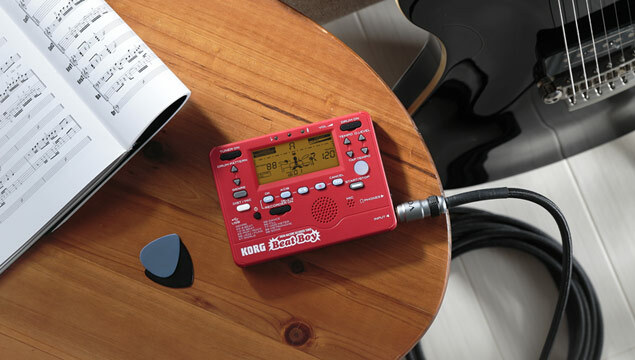 The functionality of four products is packed into this single unit; in addition to a tuner, there's a rhythm machine covering 100 diverse styles, an effect section for adding sonic variation to your guitar tone, and a recorder that allows 16-bit/44.1 kHz recording of your performances. So compact that it fits easily into the pocket of your gig bag, it's the ideal partner for any guitarist or bassist. With many rhythm patterns for you to play along with, Beat Boy is a great way to develop your sense of rhythm. It's also fun to casually jam along with the patterns, or use them to refine your riff ideas. With offerings for every genre of rhythm pattern (8-beat, 16-beat, pop, funk, reggae, dance beats, and more), Beat Boy fully supports a wide range of musical styles. The volume of the backing rhythm can be adjusted, so you can set the mix balance accordingly with your guitar, ensuring that you'll be able to clearly hear the rhythm while you jam. The LCD display shows the drums actually being struck, providing a unique visual element. The tempo of each rhythm can be adjusted intuitively by using the tap tempo feature or it can be specified as a precise numeric value for more accurate settings. The Dolcetto-T features a small clip that is optimized for attachment to the bell of a trumpet, cornet, or trombone. The Dolcetto-T can be placed into the positioning that's easiest and most visible for you. As with the Dolcetto, a transpose function is provided to support the tuning of transposing instruments. Performing with the correct tuning is one of the greatest shortcuts to improving your abilities. Beat Boy contains a tuner that ensures you'll be able to perform in correct tuning every time. A distorted tone is the undisputed king of guitar sounds. In addition to the standard clean sound, Beat Boy provides two tonal variations for a hard rock sound: overdrive and distortion. An important part of improving your playing ability is listening objectively to your own performance. Beat Boy makes it easy to record your guitar/bass sound and then play it back immediately. You can loop the playback for a desired region of the recorded sound and play it repeatedly for careful analysis, or you can practice by soloing over the loop as a backing pattern. The recorded sound can be loaded as a WAV file via USB into your computer and edited on your DAW software. Conversely, audio tracks* that you've created on your computer can be loaded into Beat Boy and used as backing tracks. The possibilities are endless! * PCM audio format: support is only included for WAV f files (44.1 kHz/16-bit monaural or stereo). The drum machine will not function while a stereo WAV file is being played back.